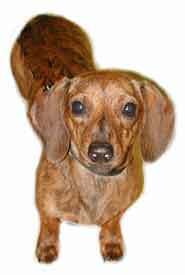 Curious, loving, intelligent, and comical are adjectives to describe the Dachshund. Still true to his nature, these dogs were bred to be excellent hunters, above and below ground and these traits are evident in their strong prey drive, their propensity to dig and their fierce devotion to the task at hand. They are fun-loving and will keep you amused with their comical antics. While being a very sturdy breed, they are prone to problems with their long backs so precautions should be taken when carrying and holding them. Jumping off the furniture can cause serious injury, so be prepared to install ramps or doggie steps. A typical dachshund has a long body and short muscular legs. Being low to the ground allows them to burrow and maneuver through tunnels. They come in two sizes, three coat types and a rainbow of colors, providing something for anyone who would love to share their home with these exceptional dogs. Their name comes from the German where they were first developed. If not socialized properly from an early age, these dogs can become suspicious of strangers; making them good from a watch dog perspective; not so good if you enjoy company. Playful by nature, they seem to be able to make up the rules for any game they choose, changing the rules whenever it suits them. They can make great family dogs, but often will choose one person to bond with and own. They are an extremely intelligent breed but because they are somewhat stubborn, they are not always easy to train. Persistence and patience will pay off and early socialization is a must. Teckel or Deckel in German. Color Patterns: Patterns in dachshund coats include dapple (light or diluted markings over the color), brindle (black streaks over the color), and piebald (large areas of white over the color). The history of the breed goes back more than 500 years originating in Germany or so the story goes. There is some evidence, however that the origins of the breed go back much farther in history at least 1000 years to Egypt. There have been dogs found depicted in tombs and drawings that resemble the breed during that era. Most agree that the Germany was the country to develop the breed. 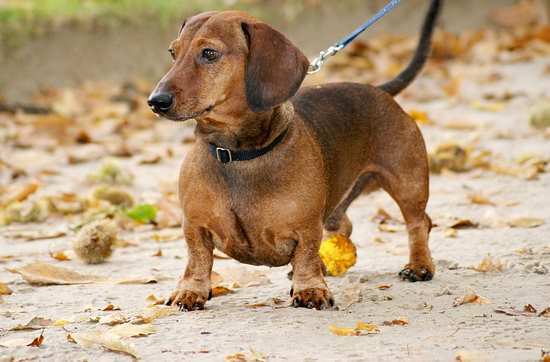 First known as a Teckel, it was then renamed Dachshund from the German “Dachs” meaning badger and “Hund” meaning dog. These dogs were developed to help rid farmers of badgers and other burrowing creatures and hunting these small animals is what the breed did best. The doxie’s determination, excellent sense of smell and courage gave him a reputation for being an excellent hunter. The breed was and still is considered to be the only one that has the capability to hunt above and below the ground. These dogs were trained and developed to not only hunt their prey, but kill it too. It’s almost comical to watch a dachshund attach a plastic toy and destroy it by tearing out the squeaker. Anything is fair game for a Dachsie, toilet paper roll, half dead insect, red laser beam! The original German dachshunds were larger than the dachshunds we know today - averaging between 30 and 40 pounds.Breeders probably used a variety of dogs to create the modern day Dachshund including the Schweisshund, Dachsbracke, Basset Hounds and Beagles. 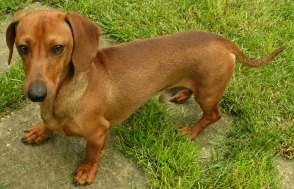 The original dachshunds were all smooth coated in a variety of colors. Later they were crossed with different types of spaniels to create the longhaired varieties that were especially popular for hunting water prey such as otters. The wire-haired dachshund was the last to be developed, late in 19th century. There is some debate as to which dogs were used to create this new variety. It has been suggested that the wire-haired dachshund was a cross between the smooth dachshund and various d terriers such as the Schnauzer, the Dandie Dinmont Terrier, the German Wirehaired Pointer, or the Scottish Terrier. Beginning in the 1800s, dachshunds were bred in England for pet purposes and their size was slowly reduced by about 10 pounds. Eventually, an even smaller version - the miniature dachshund - was bred. The earliest members of the breed came to the United States around 1870 to hunt rabbits with the first ones being registered by the AKC in 1885. The breed lost popularity during World War I due to its German origins, but began to gain acceptance two decades later. They have been gaining popularity ever since. In 2002 they were the fifth most popular dog in America. In 2012, the Dachshund’s popularity dropped to number 10, but still very impressive. In 2016, he is ranked number 13 in popularity. The descriptive words use most frequently for this breed include determined, stubborn, comical, brave, fearless, clever, and lively. Even though they belong to the hound group, their personality is strikingly terrier-like. 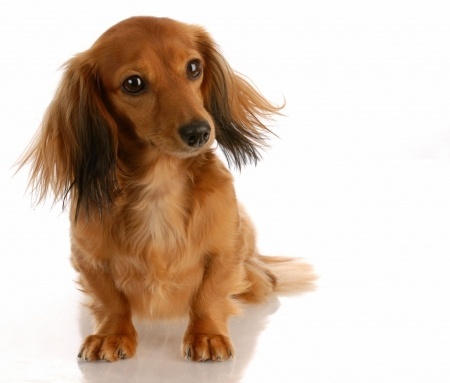 Unlike many breeds that have different varieties, the different hair coats found on the dachshund seem to bestow different personality quarks. This is likely due to the breeds that were used to create the various coat types. All Dachsie are brave, but the wire-haired variety gets dubbed the clown. Being the most terrier-like, they seem to be the ones always in trouble. The Spaniel personality shines through in the Longhaired members of the breed making them quiet, docile, and focused on humans. The smooth coated variety is somewhere in between, not wild as the Rough, not quiet as the longhair. As personality quarks goes, digging is probably at the top of the list of any owner along with barking and chasing. They were bred to dig and dig they do all so well. Whether it is in the garden on your bed, they will find ways to burrow. This breed will keep you laughing and it’s hard to resist the kisses and love that they bestow their favorite people. They make good family dogs if they are brought up with kids, but with any small breed dog, it is important to teach and supervise play so that children learn how to pick up, hold, and interact with the dog in an appropriate way. However, you should know that there are some negatives as well as all the wonderful positive reasons to own a dachshund. Housetraining is not always on their list of priorities and the process may take longer with this breed. They are often cautious around strangers and tend to bark. They are alert and will bark whenever they hear an unusual noise. They do make excellent watch dogs, but often their barking is the result of a squirrel searching for nuts two miles down the street. They are an active breed but adaptable to most any situation. Moderate exercise means a walk or two a day and a romp around the yard. Most of their exercise requirements can be met by following you around the house. But if you are more active, your doxie is likely to be a willing partner. He will track rabbits in field trials, take part in earthdog trails and even agility. They also make good therapy dogs. Another characteristic of the breed is their fondness for food. Some dogs will literally eat until they are sick. When they become obese, they are most prone to back problems, so the challenge of all good dachshund owners is to find a diet that will be satisfying but not put on the pounds. Treats should be counted into the overall daily calorie count and food should not be left out where your hungry hound might feel tempted. Strong Prey Drive: Chasing can be a problem, so all walks should be on a leash. Early training and socialization are most important to curb some of the natural tendencies found in the breed. These dogs are the perfect breed for people who do not enjoy the grooming process, although don’t think you’ll get away with doing nothing. One of the big tasks of grooming these dogs involves keeping them clean and smelling fresh. As long as your dog does not go outside, a bath one a month should be fine. 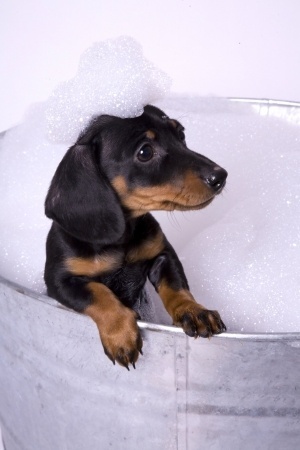 But for the average dog who enjoys a romp in the yard and a walk or two, bath time will come more frequently. Doxies love to roll in the grass and usually the spot they choose has some aroma that only they can appreciate. A quick bath will take care of that problem. Smooth haired doxies require little in the way of brushing, but a quick rub with a towel will help keep their coat soft and shiny. They do benefit from a weekly brushing because they do shed. The long haired dogs will need regular brushing so mats do not form. The wire haired coat will need striping twice a year. This is a process that involves plucking out hair; their beard and eyebrows will also need to be trimmed to keep him looking great. The hair between the paw pads will also need to be trimmed on the wire-haired and long-haired dachshund. As with any breed that has long droopy ears, good hygiene will help keep them from getting infected. It’s a good idea to get into the habit of cleaning the ears once a week with a cotton ball and an ear cleaning solution suggested by your vet. This breed is relatively healthy with most members living on average 12-15 years. The most common issue that plagues them, however, is back problem. Their long back can be damaged easily even with normal doggie behaviors such as jumping off the bed can result in a slipped, pinched, or ruptured disc. Depending on the location of the disc(s) involved, the poor dog may be left unable to walk, urinate or defecate. Surgery is almost always needed to restore normal function. To protect their backs, it is important to pick them up and hold them correctly with one arm under his hind end and one supporting his chest. They should not be allowed to jump on or off high furniture if possible so many owners will invest in ramps or doggie steps that lead do the bed or sofa. Bloat and Gastric torsion are also serious concerns in dogs that have deep chests. During an episode of bloat, air fills the stomach. If the stomach twists (gastric torsion) blood supply is cut off and is a medical emergency. Surgery is the only option for twisted stomachs. 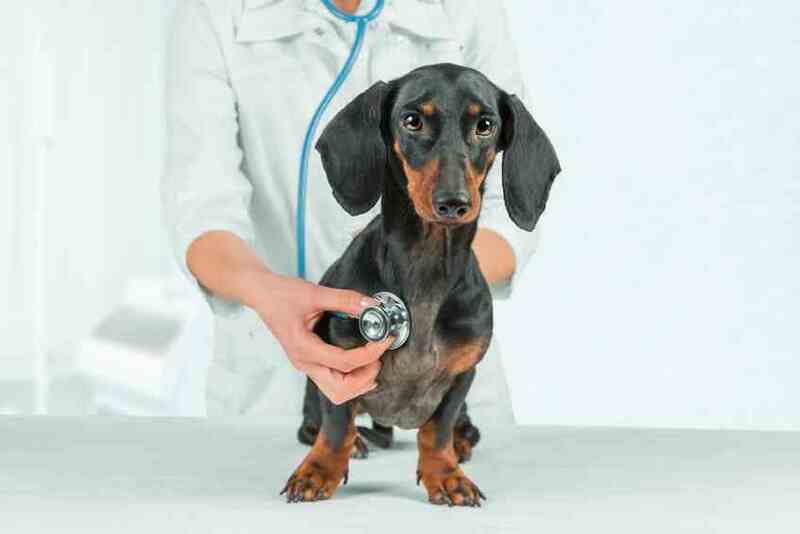 Other conditions such as epilepsy, eye disorders, diabetes, hip dysplasia and skin problems are also found in dachshunds. Deafness has also been reported in dogs who are born from parents that both have a dapple color pattern. Relatively healthy breed living 12-15 years.